116 registered members (addyguy, 53' Stude, 1978elcamino, ad244, 55hambone, 2010Civic, 7 invisible), 2,197 guests, and 25 spiders. Is my understanding correct that their non-fiber internet is still DSL based? Does the DSL still require a landline phone number or can they give you only the internet service? Any comments on the reliability, speeds, and does AT&T still like to play tricks with the billing? It is DSL based and no AT&T does not require that you have phone service to get internet. I have 18 MB dry loop (no phone) for $60 month. I don't have a contract so my service is month to month, earlier this year I got a letter from AT&T out of the blue telling me that they were increasing my internet speed and lowering my bill at the same time. I guess you could call that a billing trick. I cant say as im in canada but im pretty sure its still DSL based. Dark DSL=will assign you a phone number to ur service without requiring u to pay for the phone line. I have VDSL service through a reseller on Bell's network and it's a dry-loop without a phone-number but it does come in over the copper phone lines. They charge me $5/month for that and then the Internet charges. All total it's $56.00 / month for an unlimited cap with 50 download and 10 upload service. Thanks for the responses so far. Any comments on the reliability? Have speeds been as advertised? I have their 24/3 tier. Reliability has been fine. Speeds are more or less as advertised. They do have a monthly data cap, unless you subscribe to their TV services as well. AT&T Ultra DSL here, copper, Fastaccess XtremePro, its usually fine, I'm streaming music videos and surfing forums with no problems now. Sometimes I will get net congestion slowdown though. It's $61/month here in GA. No landline req. I used to have it. I dropped them because they wouldn't give me the same deal as the new customers. Here in the N. Georgia mountains our only choice is Windstream via DSL. 15mbs down is what they claim I get. No idea what upload speed is. $85/month (including taxes and fees). My choice to live here so I can't complain about the lack of competition. Service has been a little better this past year since they replaced a bad cable feeding our area. There is a legal firm out of either Tennessee or Alabama that's been filing lawsuits on behalf of subscribers for false internet speeds being advertised vs what's being delivered. We shall see. We're pretty much stuck. I�ve had it for years, ever since U-Verse started here. Cable is a joke here. I�ve never had any real problems. It started as 18/3, and it�s 45/5 now. When we got the upgrade, a tech had to come fix all the old splices in the wire. It�s been solid since. I've had U-Verse for almost five years. 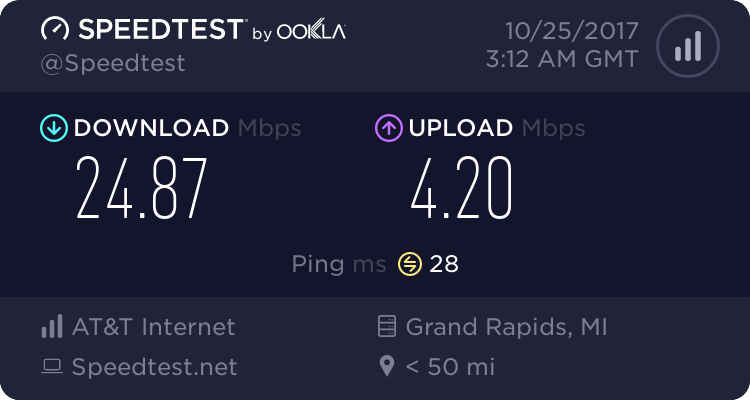 Speeds have been a little better than advertised, and reliability has been very good. Had regular DSL with a landline for about six years before that, and the only time I lost service was when my modem died. Much better experiences with both of those than with Comcast where I live. Speed is only 6Mb/s, which rATT dares to call "Elite". I was using it for 1 year and only recently switched out. Yes it is still based on DSL, but the copper wire has reduced from their switching facility to the lawn fridge; it is all fiber from there. So speed wise it can go up to 55Mbps or so if I really want, but I only signed up for 6Mbps because that's cheaper and fast enough for me. You do not need a landline phone service for that. It is reliable I've only been down for an hour once. I think they have their modem that they can log in to diagnose line quality so it probably helps. You do need to rent their modem instead of buying your own. Last year they force me to rent unless I pay for the higher cost service. This year they just raise the price and make it $40 for 25Mbps instead. I'm at Comcast and it took me 2 weeks to install, their tech support never called as promised and I was hung with a used modem stuck in another account, CS entered the wrong modem ID/MAC/etc for a long time. But it is $10 cheaper ($30) for 10Mbps when I use my own modem ($20 used from ebay). Last edited by PandaBear; 10/26/17 07:38 PM.